Sleeping Bear Resort has clean, modern lakefront cottages with fully equipped kitchens and living rooms for your northern michigan stay. 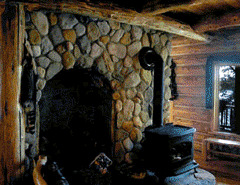 The sleeping bear resort offers log cabins that range from large lodges to cozy cabins. choose from: *6 Bedroom ” bears den “, cabin 5 bedroom lodge, & 2 bedroom cabins. We welcome children! there is a complete play area and a water trampoline where kids can have a great time, and grown ups can relax nearby! all this, and more, at rates that are more than affordable. We are a short distance from the sleeping bear dunes, golfing, Traverse City and many other attractions! Below are the latest postings from the Sleeping Bear Resort Page On Facebook. Y’all are crazy! I’m sitting here working under an electric blanket! Is this Pt. Betsie Light?